The knowledge, experience, and passion of our staff are what sets us apart. Our founder has over 25 years experience in healthcare specialising in adult mental health. We truly believe that everyone is entitled to a higher standard of health and wellness that is currently promoted. Better:Gen aims to cement the idea that movement, nutrition and a sense of community has a profound impact on cognitive abilities and is recognised as a natural and highly effective contributor to mental health improvement and symptom management (side effects can include weight loss, increased motivation & more energy). Better:Gen offers a safe environment, supportive contact and unbridled positivity and enthusiasm to help you on your improvement journey. Our vision is to reduce health inequality and improve the overall health and wellness of adults in the UK. We do this by offering programmes that are easily adapted to suit the needs and abilities of any individual or group. We also offer an outreach programme for those who cannot attend the centre. Better:Gen is open to anyone seeking to improve their lifestyle and health. Our mission is to get people more active, to invest in their own health recovery journey and feel the physical and mental benefits of leading a more active and healthy lifestyle. Regular exercise, healthily eating and wellness activities are recognised by a number of health bodies, including the NHS, National Institute for Clinical Excellence, MIND, as contributors to a healthier recovery. In 2015 there were 850,000 people living with dementia in the UK, with projected figures of 1 million by 2025. 1 in 4 adults will experience a mental health problem in their life time, and approximately 1.5 million people in the UK live with a learning disability. People with Alzheimer’s and other types of dementia tend to be at a high risk of falling, and are more than 3x more likely to fracture their hip if they fall, which leads to surgery and immobility. 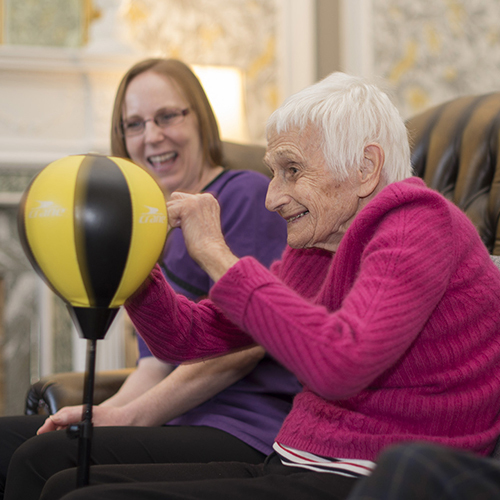 Although it has been well documented for many years that exercise can drastically reduces the risk of these types of diseases, one third of over 65s do not engage in any leisure activities. Here at Better:Gen we want to tackle this problem head on.